The H145M is a multi-role battlefield support helicopter from Airbus Helicopters. Image: courtesy of Airbus Helicopters - Charles Abarr. The maiden flight of H145M was successfully conducted in November 2014. Image: courtesy of Airbus Helicopters - Charles Abarr. 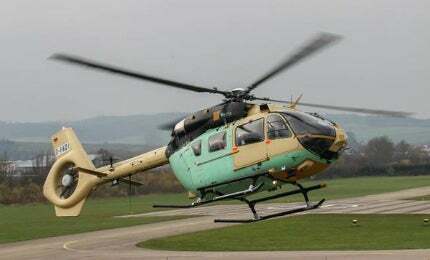 German Armed Forces ordered 15 H145M helicopters. Image: courtesy of Airbus Helicopters / Charles Abarr. The H145M ( previously known as EC145 T2) is a multi-role twin-engine battlefield support helicopter produced by Airbus Helicopters. It is primarily intended for use by military and law enforcement agencies. The helicopter can be deployed in transportation, special operations, intelligence, surveillance, target acquisition and reconnaissance (ISTAR), search-and-rescue, fire support, and medical evacuation missions. The maiden flight of the H145M was completed in November 2014 and European Aviation Safety Agency (EASA) certification was received in May 2015. The H145M performed its first flight with HForce weapon management system in September 2017. AS332 C1e Super Puma is a new-generation, twin-engine helicopter in the Super Puma range. The German Armed Forces (Bundeswehr) placed a €194m contract with Airbus Helicopters for the delivery of 15 H145M helicopters to the German Air Force. The first two H145M helicopters were delivered to the German Armed Forces in December 2015 and the deliveries were concluded in June 2017. Airbus received a contract from Bundeswehr in June 2015 to deliver comprehensive service support for the H145M fleet, which have been commissioned by the German Air Force to perform operations with Special Forces Command (Kommando Spezialkräfte). The Royal Thai Navy ordered five H145M helicopters in October 2014. The first two helicopters were delivered to the Royal Thai Navy in April 2016. The Republic of Serbia ordered nine H145M helicopters for the Serbian Air Force and Police forces in December 2016. The Hungarian Ministry of Defence placed an order for 20 H145M helicopters fitted with HForce weapon management for the Zrinyi 2026 military modernisation programme in June 2018. Airbus secured an order from the Government of the Grand-Duchy of Luxembourg for two H145M helicopters in July 2018. The helicopters will commissioned by the Luxembourg Defence in 2020. The H145M is an economical and versatile military helicopter based on the proven EC145 helicopter family. It features advanced main and tail rotor gearboxes, as well as a Fenestron shrouded tail rotor for better anti-torque control. The tail rotor is fitted with composite asymmetrical blades that reduce noise levels. The H145M can seat up to 11 personnel including crew and troops. The large cabin space accommodates up to ten troops in a high-density air assault layout, or a fullyequipped force for special operations. Troops can rapidly ingress / egress through large sliding side doors and the rear clamshell door. The rotorcraft can be fitted with mission equipment kits, including a fast rope system, and cargo hooks and hoists for transport and utility missions. The helicopter has a maximum take-off weight of 3.7t and can carry a useful load of 1,769kg, whereas its sling load capacity is 1,500kg. It measures 13.6m in length when rotors are in operation and has a width of 2.7m when blades are folded. The height and main rotor diameter of the helicopter are 4m and 11m, respectively. The H145M is equipped with a modern digital glass cockpit that integrates Helionix® avionics suite. This cockpit is compatible with night-vision goggles (NVG). It houses a head-up display (HUD) and a helmet-mounted sight display (HMSD) with day and night piloting and firing capabilities. Featured on the military helicopter is a mission computer, an infrared / TV electro-optical system, an emergency locator transmitter (ELT) and a laser range-finder / designator / pointer. The four-axis digital autopilot aboard the cockpit reduces crew fatigue. The helicopter can be fitted with an incremental modular weapon system to engage conventional and asymmetric threats in the battlefield. It is compatible with seven-tube and 12-tube rocket launchers, a 20mm cannon pod, a 12.7mm machine gun pod, and air-to-surface missiles. It can also be configured to carry laser-guided rockets, as well as equipped with the HForce weapon management system for light-attack missions. The helicopter integrates self-sealing fuel tanks, ballistic protection, infrared (IR) suppressor, and crashworthy seats. The low-profile, crashworthy fuselage and redundant flight systems improve the survivability of the helicopter. Electronic warfare systems such as a radar warning receiver, laser warning receiver, missile approach warning system and chaff / flare launchers further improve the endurance in high-threat scenarios. The H145M is powered by two Turbomeca Arriel 2E engines equipped with dual-channel full-authority digital engine controls (FADEC). Each engine develops a maximum continuous power of 771shp (575kW). The helicopter has a fast cruise speed of 244km/h, a maximum speed of 250km/h and maximum range of 662km. Its outstanding hover performance allows for operations at altitudes of 2,700m (8,858ft).